Sometimes it's really hard to know which way God wants us to go, isn't it? Does God want me to date this person or stay single? Does God want me to try out for the basketball team or not? Does God want me to apply for this college or that one? So many questions! It can be exhausting! So how do we know what He wants? How do we know which is the "right" choice? There are two main questions to ask yourself when you're wondering which way God wants you to go in your life. 1. Does what I am considering go against God and His Word? If you are faced with a decision and one option is forbidden by the Bible, obviously God would not want you to choose that path. For example, should I use my free time to play a game with my little brother or go to a party where there's drinking? Ephesians 5:18 says, "Do not get drunk on wine, which leads to debauchery. Instead, be filled with the Spirit." That decision was easy! Definitely hit the dice over debauchery. 2. Does what I am considering glorify God? Everything in life will end up doing one of two things: 1. Bring us closer to God. 2. Lead us away from God. 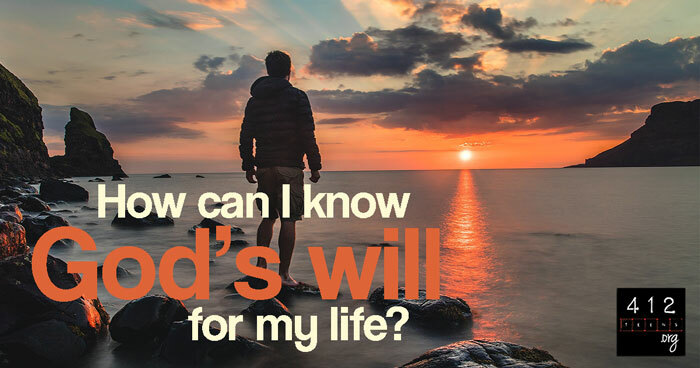 So in finding God's will for your life, from the small daily things to the major long-term things, He is certainly going to lead you in the direction that will bring glory to His name and help grow you spiritually. After asking these two questions, you should have a better idea of which direction God would like you to go. Be patient and ready to listen. God isn't usually a fan of instant gratification (even though we are). Patience is a virtue believers should be developing with the help of the Holy Spirit (Psalm 40:1). God's timing is always going to be better than our own. Remember that He sees your whole life as a complete story, so He knows what and when is best. All we can really see is what is happening around us right now. What if God doesn't give me a clear answer? If you have been patient but still haven't heard back from God on your question, keep praying and keep following Him persistently. I know it's hard to wait, but God will not forget your requests! He may have decided that your will doesn't line up with His, so He is telling you "no" or "not now." For example, maybe you would love to get a date with that new hottie that moved in down the street, but after praying for weeks, your new crush won't even say "hello" to you. Well, maybe it isn't in God's will that you get a date with that person. Maybe God wants you to develop friendships in youth group instead? Or maybe He knows that "hottie" wouldn't be so good for your relationship with Him? In these situations, it is best to follow Proverbs 3:5 and "trust in the LORD with all your heart and lean not on your own understanding." After all, He made you and knows what would make or break your heart. But I need to know exactly what to do! Keep in mind that God rarely gives us a specific list of GPS directions, customized to our own lives that says, "Okay, wake up, eat Cheerios for breakfast using the blue bowl, take the short-cut to school, go to homeroom first, then take the stairs to Spanish class, then..." No, God gave you a brain for a reason! Tap into your God-given common sense during the decision making process as well. We have free will and intelligence, and God would like us to use those just as much as He wants us to seek His specific will. Romans 12:2 gives some great advice about making choices that would align with God's will: "Do not conform to the pattern of this world, but be transformed by the renewing of your mind. Then you will be able to test and approve what God's will is—his good, pleasing and perfect will." God wants to see you grow as a Christian and make decisions according to your desire to please Him—not yourself. Walk closely with Him and regularly pray and read the Bible; you'll find yourself becoming very familiar with recognizing God's will. What if ALL the choices are good ones? Then there are the decisions where it seems like all your options are good, godly ones, or that the choices are honestly neutral—neither good nor bad. These situations may seem frustrating, but you want to know the cool thing about these times? This may be a place in your life when God is saying, "I leave this decision up to you." That's right! God may be showing His confidence in you by trusting you to make the right decision. Don't get freaked out by that though; if He is giving you the choice, there is no way you will choose "wrong." ☺ The trick is that your heart's desire should be to want God’s will—not your own. Psalm 37:4 says, "Delight yourself in the LORD and He will give you the desires of your heart." If all the choices align with the Bible and everything you know to be true about God, then you have permission to humbly make those choices, following a heart that follows God. The next time you are faced with a decision, first weed out the ones that would cause you to sin, then analyze your options. Which ones would bring you closer to Him? Which would lead you away? Strike out the ones that would lead you farther away from God spiritually. What you are left with will be a considerably smaller list! God loves to reveal His will to His children, so keep chasing after Him and getting to know Him. He will guide you. John 16:13 says, "But when he, the Spirit of truth, comes, he will guide you into all the truth. He will not speak on his own; he will speak only what he hears, and he will tell you what is yet to come." God rarely gives us a specific list of GPS directions for our lives. Usually it's a day-by-day, sometimes minute by minute, method of guidance where we must listen and respond. Your job as a Christian is to make decisions according to your desire to please Him—not yourself (Romans 12:2). Walk with Him, talk with Him, read the Bible. Soon you'll find yourself becoming very familiar with recognizing God's will (John 16:13).